Eclipse map/figure/table/predictions courtesy of Fred Espenak, NASA/Goddard Space Flight Center. The solar eclipse on August 21st, 2017 was the first eclipse to cross the US in 99 years! 99 years may not be a long time in geological terms but just short of a century is more than a lifetime for most of us. 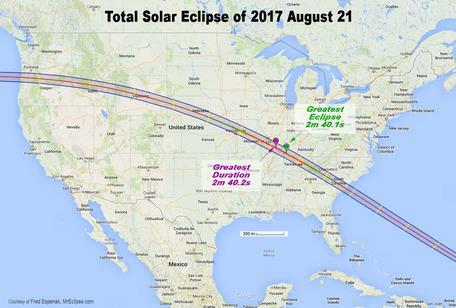 The total eclipse—where the moon is completely blocking the sun—was visible from the US starting in Oregon on a nearly linear path ending in South Carolina. Most states were able to see at least a partial eclipse. EclipseMob is a citizen science STEM project to conduct the largest-ever low-frequency radio wave propagation experiment during the 2017 solar eclipse.